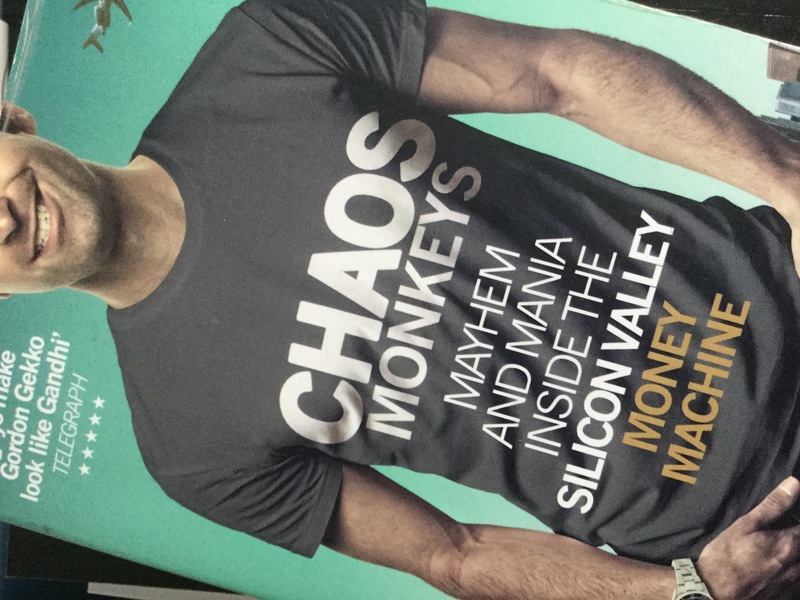 On the strength of a long review of several recent tech books by John Lanchester in the London Review of Books, I read Antonio Garcia Martinez book Chaos Monkeys, which is mostly about his time as a willing hand in Silicon Valley, first in a startup and then as a product manager in Facebook’s ad department. Chaos Monkeys takes us from Goldman Sachs to Facebook, and out the other side, via a digital ad business called Adchemy, the start-up ‘school’ Y Combinator, and the startup, AdGrok. Mostly Martinez is a good guide; especially to the world of venture capital and startups. Martinez persuades a couple of engineer colleagues at Adchemy, which is clearly struggling, to pitch to Y Combinator, the start-up hothouse then run by Paul Graham. Going in, they have a product concept that probably isn’t going to work, but that doesn’t matter because Y Combinator, like much of the rest of Silicon Valley, is as interested in teams as it is in products. Why isn’t their product going to work? This is a flash of innovation insight that’s worth the price of the book and quite a lot more. When confronted with any startup idea, ask yourself one simple question: How many miracles have to happen for it to succeed? If the answer is zero, you’re not looking at a startup, you’re just dealing with a regular business… To be a startup, miracles need to happen. But a precise number of miracles. Y Combinator is particularly good at getting its progeny in front of investors, but even allowing for that the commitment, rat-like cunning and persistence needed to get it across the line with investors and an eventual acquisition is more or less complete. As he says when he has the chance to pitch to a potential buyer and has a computer glitch, rule #1 of the start-up is “Always be closing”. The history of AdGrok, and its eventual acquisition following some initial investment, is almost a case study in VCs at work, and Martinez is pretty good at explaining the mechanics of how the VC business works (and the different and sometimes conflicting things that different types of VCs want from the eventual deal), even if you sometimes have to go back and check on some of the technicalities. This focus on the mechanics of the start-up reminded me of Jerry Kaplan’s 1990s classic Startup. I hadn’t realised before I read the book of the extent to which the big Silicon Valley companies use startup acquisitions as a way of acquiring talent rather than software or patents. The rationale is that acquiring good product managers and engineers is difficult, and they come expensive, so using discussions about their product is a good way of assessing cultural fit. And bringing in people who have been through the startup mix, rather than looking first for a long-run career at a big company, injects some energy into the culture, and that energy is worth paying a premium for. In the end (spoiler!) Martinez has the chance to go to Twitter or Facebook. He chooses Facebook because of the full-on nature of the demands that the business makes of its staff, compared to Twitter, and this was partly learned from a casual remark from a Twitter engineer, when Martinez asked him what he liked most about Twitter. If he’d stayed with the rest of the AdGrok team and gone to Twitter, he’d also have been about $1m better off and would not have burned his bridges irrevocably with one of his investors. And no: nowhere in the book does he make the connection between these outcomes and his disdain for Twitter’s failure, at the time, to serve dinner. There are things not to like about Chaos Monkeys. It’s readable, but it’s too long; a competent editor could have taken 80 pages out of it without blinking, and improved it a lot. For example, I didn’t need to know about an inconsequential fling with a Facebook colleague in a company stationery cupboard, nor his streetrace in a carshare Tesla; I already knew he was reckless and competitive by then. He tries not to be, but he’s too pleased with himself a lot of the time. The lawyer who bailed AdGrok out of a hole may have agreed to a terrible deal (he accepted equity in the startup with no risk premium) but I’m not sure why Martinez needs to rub his face in it. There are too many footnotes, all too long. He tips his hat in a look-at-me sort of way to Michael Lewis’ Liar’s Poker without really understanding what made that such a fine book (well written, aware of his own shortcomings as a bond salesman, telling anecdotes, watching the start of deep transformation in the way investment banks work.) Martinez is a good observer, but if he were chocolate he would eat himself. The reason that the advertising market and its monetisation became so important to Facebook in that period was because of its IPO–its revenues were flat and it needed to show growth to its new shareholders. The solutions that were attempted were basically a develop of Facebook’s existing, but closed, ad platform, and FBX, Martinez’ project, which was an open platform. Facebook’s culture and model is about closed systems, and that approach commanded most of the resources. The FBX platform, with its small team and limited resources, was essentially an insurance policy, although Martinez, for all his smarts, never seems to realise this. But the thing that saved Facebook’s financial position was neither of these things. It was the rapid shift in 2013 towards mobile and device use. If the shift was expected, its timing and speed were not. This allowed Facebook to insert ads profitably into user feeds on mobile. Despite being fired by them, Martinez clearly remains a fan of Facebook. He defends its position on privacy vociferously (they’re not a threat to your privacy, he says) and he admires the focus that Zuckerberg has on avoiding complacency. When Facebook moves into Sun’s former buildings in Menlo Park, Zuckerberg left some of the old Sun signs up, as a reminder, as it were, that this too could pass. When Google launched Google Plus, a clear bid for Facebook’s market space, the phrase Carthage delenda est (“Carthage must be destroyed”) became a company catchphrase. John Lanchester, on the other hand, is not such a fan. He sees Facebook as the exemplar of a new form of surveillance capitalism. More on that in another post.